Nelson Bar & Lobby Lounge at the Grand Hotel Heiligendamm in Germany is an intimate setting with wood walls, where in addition to a wonderful cocktail menu and evening entertainment, they also feature Fondue Chinoise. The Grand Hotel Heiligendamm in Heiligendamm, Germany is a stunning compound of historical buildings, and the Nelson Bar & Lobby Lounge located in the Grand Hotel building built in 1886, is certainly one of them. As cocktail and lounge enthusiasts we appreciated the old world clubby atmosphere, as well as the excellent cocktail menu which features their signature Lord Nelson cocktail (Hennessey Cognac, Martini & Rossi, Graham's Port, Grenadine, and Orange Juice). One of the specialties of the Nelson Bar & Lobby Lounge is Fondue Chinoise, which of course we decided to try. Fondue Chinoise does not involve cheese as in the case of Swiss fondue, but is rather a hot pot with simmering chicken stock to cook your meal. Once seated at our window side table, our waiter, Mr. Frank Hagedorm, brought out a large cast iron pot and placed it on a hot plate on our table. Soon the fragrance of simmering stock filled the air enticing our appetites to wake up. Mr. Hagedrom returned a few moments later with a large rectangular white platter artfully arranged with a colorful selection of sliced yellow and red peppers, baby ears of corn, Chinese snow peas, leeks, carrots, and cabbage, which he set on a smaller low table next to our table. He returned yet again, carrying another large rectangular white platter this time arranged with sliced salmon and shrimp, as well as duck, pork, beef, and chicken. A veritable feast was awaiting us; all we had to do was decide what we wanted to eat first, add it to the simmering stock, let it cook for a few minutes, and then ladle it out onto our plates. Mr. Hagedorm advised that after the meal is cooked, many people like to enjoy the rich broth, which was something that we would look forward to trying. We began by adding vegetables and seafood to the simmering stock, arranged rice noodles as well as wheat noodles on our plates, and snacked on crispy shrimp chips while waiting for the feast to begin. Feeling like fishermen, after a few minutes, we carefully dipped the wire basket into the stock and were rewarded with crisp-tender vegetables and perfectly cooked seafood, which we placed on top of the noodles. Next came the selection of accompanying sauces that we could add to enhance the flavor of our dinner; bowls of spicy chili pepper, sweet chili pepper, soy, honey, teriyaki, cocktail, and Japanese vinegar mixed with soy. Little by little we tasted each of the sauces as we plated each of our culinary creations on our plates. Before we knew it, we had finished both platters of food, and had a wonderful experience "cooking" in Heiligendamm, Germany. 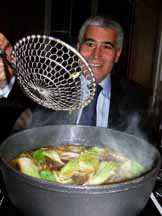 As a finale to the Fondue Chinoise, Edward carefully ladled the rich broth from the vegetables, fish, seafood, poultry, and beef into his bowl, and enjoyed every last sip. Mr. Hagedorm returned to remove the Fondue Chinoise accoutrements, and tempted us with a "light dessert of sorbet and fresh fruit," which we readily agreed to sample. 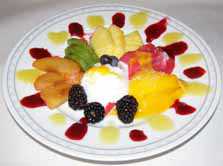 We were quite surprised when he returned bearing a very large platter of sliced kiwi, pineapple, oranges, plums, blackberries, and blueberries, and bowl with large scoops of exotic sorbets of mango, coconut, and raspberry, and two bowls of fruit coulis. Appetizingly presented, of course we had to sample each of the sorbets and accompanying fruits, which as Mr. Hagedorm had advised, was a very refreshing and actually a light finish to our meal. After dessert, Mr. Hagedorm brought two bottles to our table, Swiss Kirsch, and German Wild Kirsch for us to enjoy, and it was interesting to note the differences in styles of the Kirsches in both the nose and on the palate, with the German Wild Kirsch providing a deeper aromatic nose and richer fruit on the palate. Since we were in Nelson's Bar & Lounge, it was a very appropriate and tasty finale. Read other articles on the in Grand Hotel Heiligendamm the Destinations, Hotels and Resorts, Spas, Restaurants, Chefs' Recipes and Adventures sections. For information on Heiligendamm and Bad Doberan, please visit the website, www.Bad-Doberan-Heiligendamm.de. © May 2008. Luxury Experience. www.LuxuryExperience.com All rights reserved.